The fourth quarter of Game 1 between New Orleans and Portland was all about defending the rim out of pick-and-roll. It was a battle New Orleans won in this first game — and it's one that will likely define the series. It probably wouldn’t shock you to learn that the Pelicans have been one of the league’s best teams finishing around the rim. They have surrounded Anthony Davis and his elastic arms with shooting, putting opponents in a bind: help on Davis’ rolls and open up the three point line, or stay home on shooters and risk Davis getting the ball in tight, where he’s all but unstoppable. And sure enough, this season the Pelicans have taken the 8th most shots inside of four feet and converted 65% of those attempts, the sixth highest mark in the league. 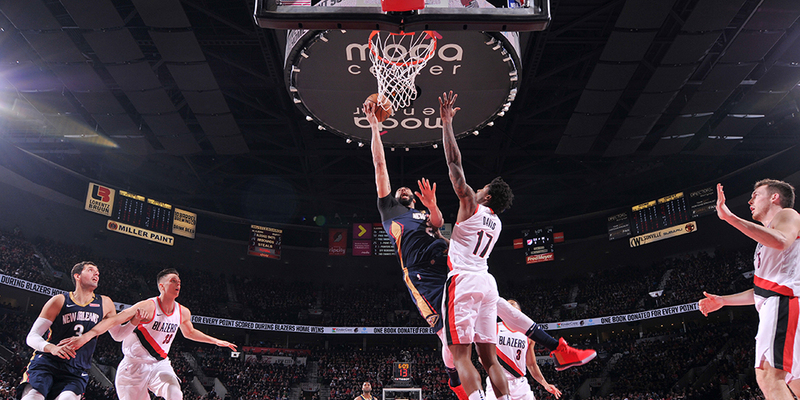 But it might surprise you that New Orleans’ first-round opponent, the Portland Trail Blazers, are the league’s stiffest challenge to Davis’ rim-rocking ways: the Blazers led the league in FG% defense at the rim, allowing opponents to convert just 55% of their attempts there. Not only was the Blazers’ rim defense the best this season — it’s one of the best marks we’ve seen in recent history.